We've had Mythic Legions Series 1.5, we've had Mythic Legions: Coliseum, but at long last, the official Series 2 has arrived! It's been nearly two years since the Kickstarter began, but all the production delays and shipping issues are in the past, so the Legions are on the march! The subtitle for this series is "Advent of Decay," but the story on the back of the card is the same as before, so if this new name means anything specific (rather than just being a way to draw attention away from the fact that "Series 2" is actually the fourth assortment they've done), we don't know what it is. It's not like this series is particularly focused on villains or anything - we get several new species (elves, goblins, etc. ), but it still seems pretty evenly split between the forces of light and darkness. The factions are the same, which is why this Skeleton Soldier can still be a member of the Congregation of Necronominus. The previous figures have all been men, and have all used the same three torsos - bare, clothed, or armored - to build their bodies. Advent of Decay introduces a new bodytype, suitable for women and twinks. In fact, since this is a generic army-builder release instead of a specific character, it comes with both male and female chests, so you can build whichever way you want. That's right: a transgender skeleton. This is the future that liberals want. 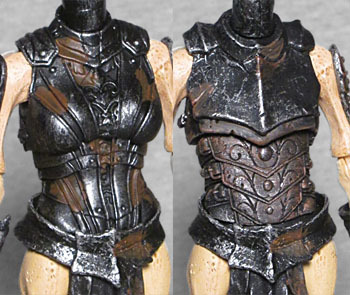 The female chest has the same pattern of inset X's that the armor had in Series 1, while the male chest is wearing armor that's bare and pointy, similar to the rough orc armor. 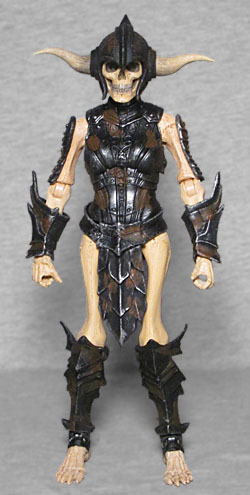 The armor on the shins, forearms, waist, and shoulders is the same orcish style, just done smaller to fit the new body. The Four Horsemen went all-in on making this an army-builder, not only giving it two torsos, but also two heads. Want to display all its potential looks? You're already up to buying four of it. One head is a completely bare skull, though not either of the sculpts from Series 1, while the other is the same skull but molded wearing a hemlet. 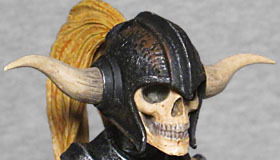 The helmet has ports on the side where horns can plug in, and a small hole on the back were you can attach your choice of a small spike or long blonde hair (probably horse hair, since this is a fleshless skeleton). 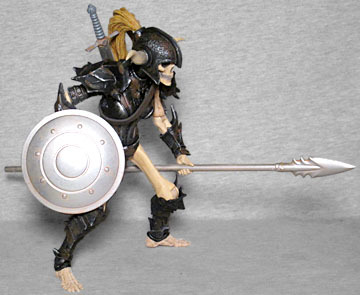 While the first series of Mythic Legions were built using the same selection of modular pieces (as were the Series 1.5 and Coliseum figures), Series 2 changes things. The toys are still going to be modular, but the skinner bodies required skinnier joints, meaning the existing parts wouldn't work. So these will only work within their own assortment, not with the other three. The articulation we get includes a balljointed head and torso; swivel/hinge shoulders, elbows, wrists, hips, knees, and feet; and a swivel waist, forearms, and ankles. So the joints aren't an exact copy of the old layout, but they still cover all the same range of motion. A little more, in fact! I did get a couple loose joints (the right hip and the left ankle) and a few of the hinges are really stiff to get moving - that's unusal for a 4H toy. We get plenty of accessories, too! 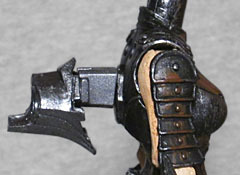 Even beyond the extra head, extra torso, and extra helmet decorations, there's a pair of wickedly pointed pauldrons, a small brown strap to go around the torso, the spear and small sword seen so often in the first series, and a new, round shield with a separate handle that plugs into the back. There are also three... things. Their purpose isn't immediately clear, though it's apparent that they plug into the figure's back. There are two fancy, swept-back ones, and one that's a much plainer block. It turns out that they're mounts for wings - remember the Gothitropolis birds? Remember the wings that were available for them? Well, just as those wings also worked for the Scarabus figures, the Horsemen wanted to make them work here. The idea was to have them use the same holes the shoulder pauldrons would fit into, butthat required retooling the pegs: the new ones are much bigger than the old ones. So that you wouldn't feel forced to buy new wings if you already had a set, one of the backpack pieces has holes sized for the small pegs; and if you want to use wings and pauldrons at the same time, the other piece has holes for the large pegs. The extra block is basically an extender, making the backpacks hover away from the body for... reasons? It's minorly annoying that the new Mythic Legions use a different body system than the old ones, sort of like if Lego suddenly decided to change the way they make their bricks. But I also have to admit that I was probably never going to disassemble my figures to build something new, so any "disappointment" in that regard is purely academic. We've got new Legions with new bodies, but they still look great in the collection.